Our annual Christmas competition was held on Saturday 9th December and 22 competitors braved sub-zero temperatures on Haywards Farm Lake. 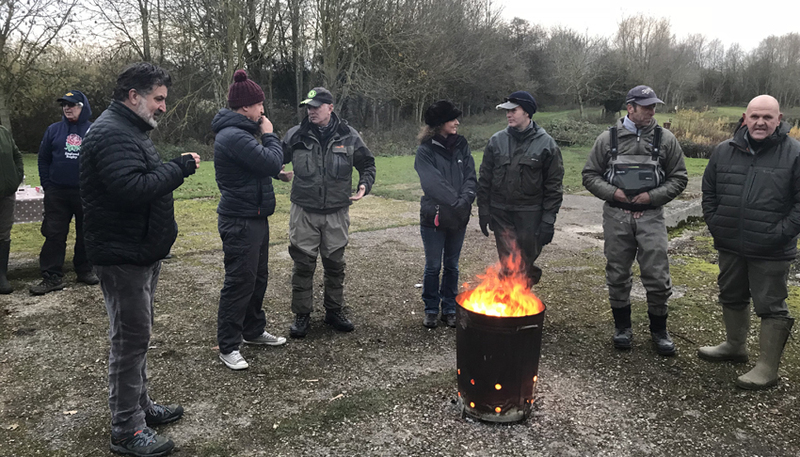 Pegs were drawn at 10 am whilst enjoying hot bacon baps and even hotter drinks and at their first peg the anglers prepared hands for the icy water and, on the gun, started casting. Anglers were permitted to keep their first two fish, the weight of these going to their final score. Subsequent fish were released, recorded and allocated an average weight. 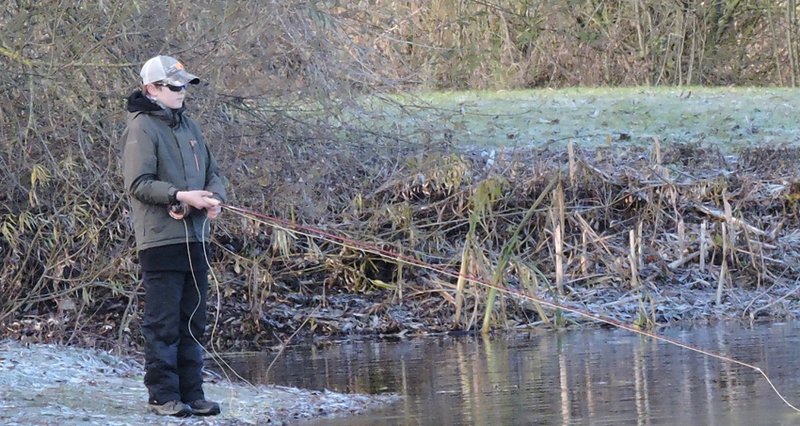 It was immediately evident that fishing from the bank was the favoured option by most, with only a few crunching through the ice into deeper water. A few minutes later fish were caught, Rob Allen landing the first of them, and this was the start of what proved to be a day that saw most anglers net fish. It was also obvious that, whilst being a social competition, it was being taken seriously. With hampers, free fishing vouchers, and tagged fish up for grabs everyone was certainly concentrating. 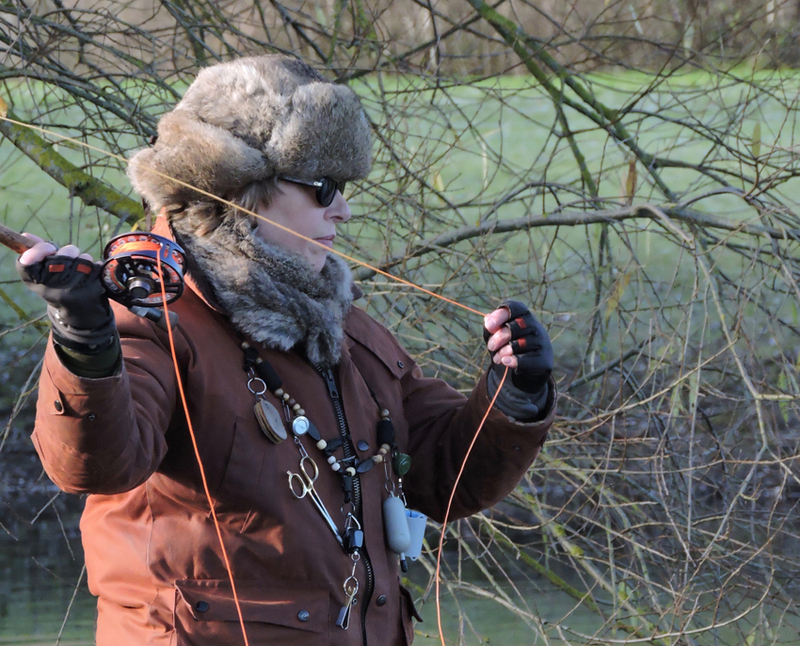 It was also great to see ladies and younger anglers represented, Karen Woolley certainly made up for the lack of fur on her fly; a sensible option considering the consistently low temperature, it obviously worked, as she landed trout. Alexander Jeffrey also did very well, landing several fish and winning a day’s free fishing for his efforts. On the hour, anglers rotated around the lake by five pegs, giving everyone the opportunity to fish all the bank. In total there were five rotations, which made for a complete lap of the lake and ensured everyone kept up their fitness steps, allowing for guilt free hot drinks, mince pies, and a nip of the stronger stuff. Outdoor central heating was provided for the post-match discussion. In first place was Rob Allen with a weight of over 30lb. He also caught the largest fish of over 7lb, so all-in-all it was a very good day for him. 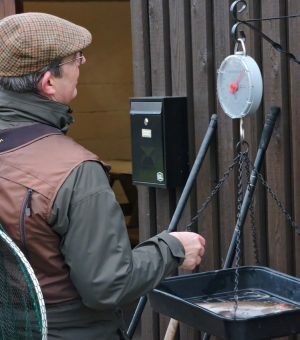 Second was Sportfish’s own Jonathan Tomlinson with a weight 27lb. Ray Constable was third with 17lb. 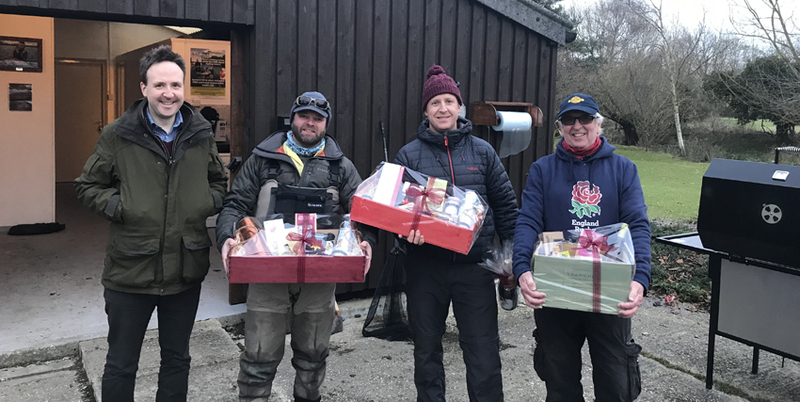 Game Fishing Centre Manager, Jonno Randall (L), presented prizes to: Jonathan Tomlinson (2nd), Rob Allen (1st) and Ray Constable (3rd). After very complimentary remarks from anglers, we are currently planning further social competitions and events throughout the year. We want to encourage everyone to have a go, especially ladies, younger anglers, and those of you who have never fished a competition but would like to have a go. We are also looking at the possibility of a fishing league, where we can combine the fun of fishing with learning those tactics and methods that you need to brush up on. So please spread the word and watch this space.